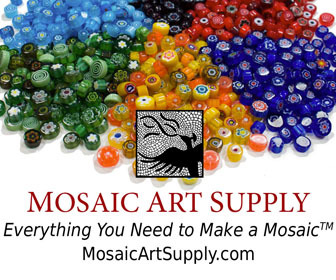 Lastly, keep in mind that if your mosaic is mounted high or some other place where people can’t stand up close and inspect it, they won’t be able to tell if the mosaic is vitreous or smalti. All that being said, the color palette of vitreous is more limited than that of smalti, and so that may be reason enough to use smalti, but you may find the colors you need in recycled glass tile, which is non-grainy like smalti, but is cheaper and easier to cut with less waste. It all comes down to what colors you need and if they are available in a particular type of tile. Mixing brands is not a problem, but mixing molded tile with smalti is problematic, mostly because the smalti is hand-cut and thicker. 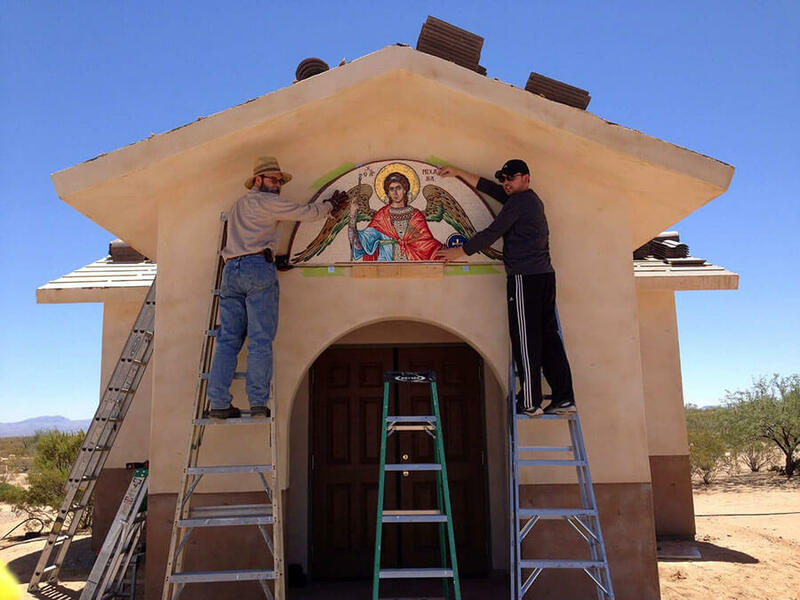 Artist Micah Andrews emailed me some technical questions about a mosaic he was making for a small church in the Arizona desert. Although Micah was using our method of placing clear contact paper over the pattern with the sticky side up and laying out the tile on that, he was using traditional materials and methods for everything else. 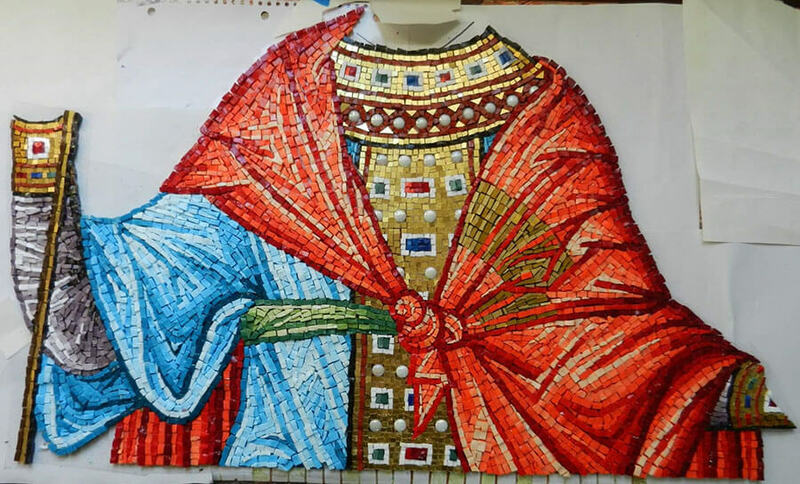 Traditionally, once a mosaic is laid out on a temporary bed of clay or lime putty, it is picked up with cheesecloth and rabbit-skin glue. Micah emailed me because when he applied the rabbit skin glue, it ran down between the tiles and even got beneath them and on their bottoms. Micah’s question was whether or not this temporary glue might interfere with the mortar bonding securely to the tiles. After the cheesecloth and glue dried to the faces of the tiles, Micah picked the mosaic up off the pattern and flipped it over and cleaned the bottoms of the tiles with warm water and cotton swabs, taking care to not drip water down to the cheesecloth and glue that held it all together. In hindsight, Micah observed that it would have been better for him to have used a traditional bed of clay or lime putty instead of our modern method of contact paper over the pattern because the bed of clay better accommodates the irregular smalti. The modern method of using sticky contact paper as a temporary surface is better suited to molded tile like vitreous or recycled glass. Roman mosaics were not grouted. Instead, the tesserae was packed closely together so that there was just a thin crack between each piece. This worked fine in the gentle climate of the Mediterranean basin because there was little or no cold weather to cause precipitation to freeze between the tiles and crack them all to pieces. Keep in mind that you need to take your local climate into account before deciding to install on non-grouted mosaic or a mosaic made from vulnerable materials. Else you may experience freeze damage. Hi there. I have old windows I want to mosaic for outdoor art. If I’m using ceramic pieces straight onto the glass, what adhesive do I use? You should use thinset mortar. Hi, I’d like to mosaic the wooden post for my mailbox outside. I’ll probably use vitreous glass tiles. What would be the best adhesive? And would you recommend that i glue my tiles to mesh and apply the mesh to the post with ______________adhesive? Grout or no grout? Thanks! Wood is not an acceptable backer for outdoor and wet mosaics. You would need to replace the wooden post or screw foam-core backer board to the post. 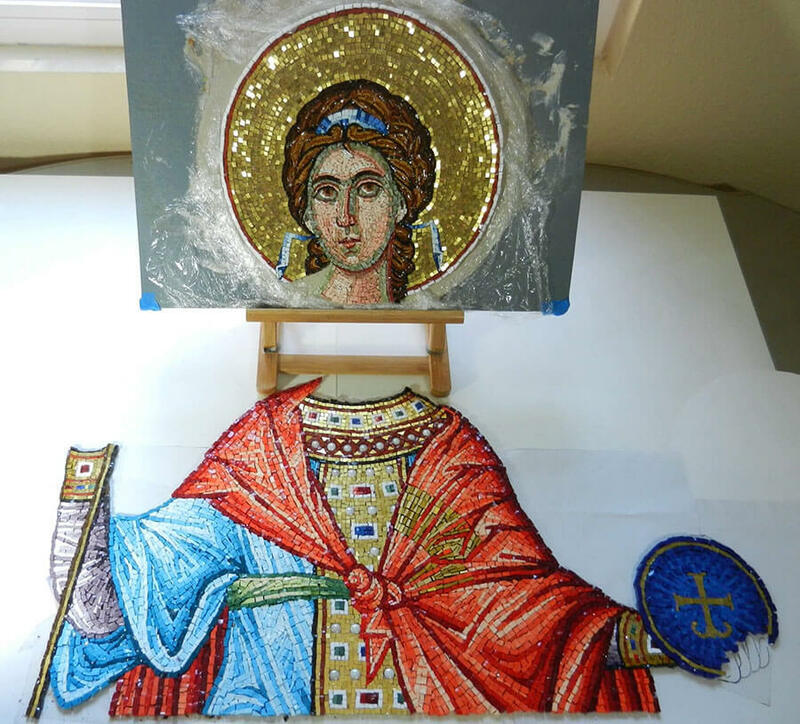 We recommend mosaic mounting tape or mosaic mounting paper instead of mesh. Outdoor mosaics are mounted with thinset mortar. 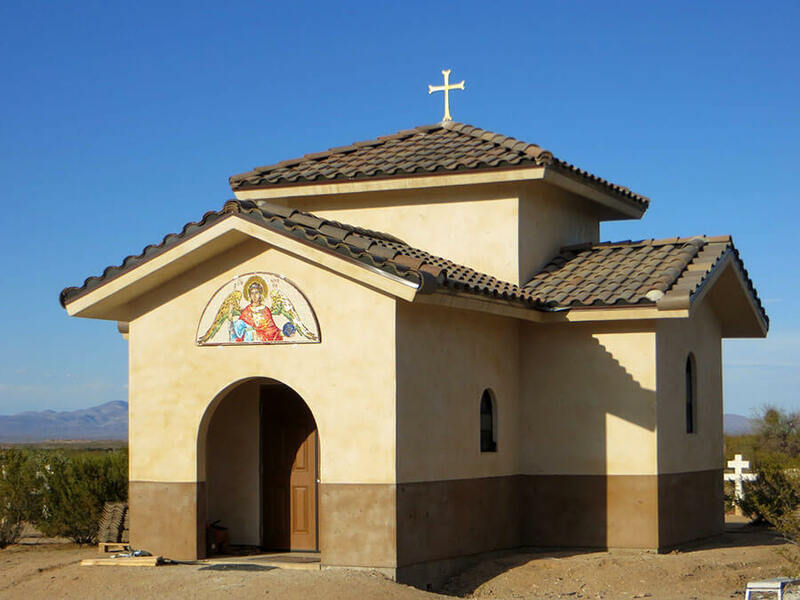 This mosaic of St. Micahel by Micah is beautiful….and it stands out beautifully in the desert! Your comments on choice of tile/smalti and using contact paper vs. clay was very helpful. 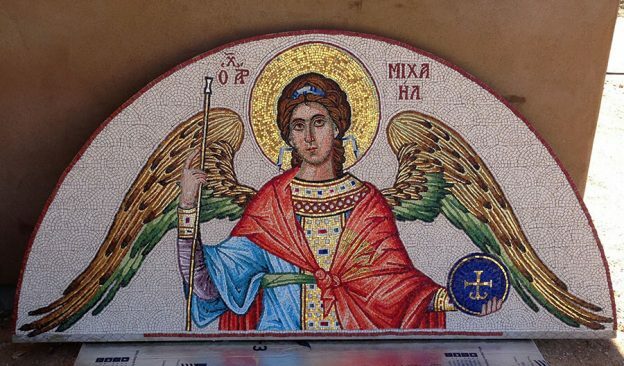 I’m currently working on a much less intricate Angel mosaic. I was wondering if you ever have classes specifically for doing icons? I would love to be able to attend one. Thank you for sharing this (I know I’m late to see it)!